It was about 5 years ago I was Wooffing on your farm. I hope it's going well? I am back in London now, settling down! I got married at the beginning of this year and working in urban farming and leading workshops in schools on food growing and healthy eating. I recently was in a cafe in London and saw a large sack on the wall with the bob-o-link logo, it made me smile and remember fondly my time on the farm with you and your family. Did you know your sacks travel far and wide!? I would love to buy one, is there somewhere online I can order one? I want to have it up in my living room! Either way, I thought it would be nice to touch base and hear how things are going there. Do you still have wooffers on the farm? I fondly remember the delicious cooking, avocados, bananas and the lovely pond and of course days of cleaning the bee boxes. 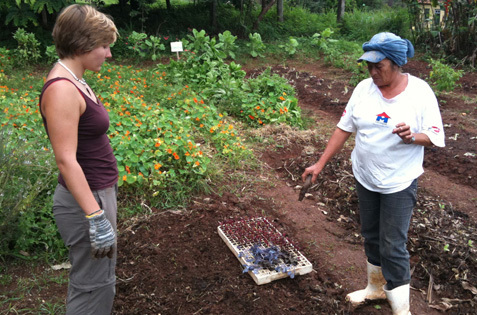 FAF has been a wwoofing host farm since 2010. 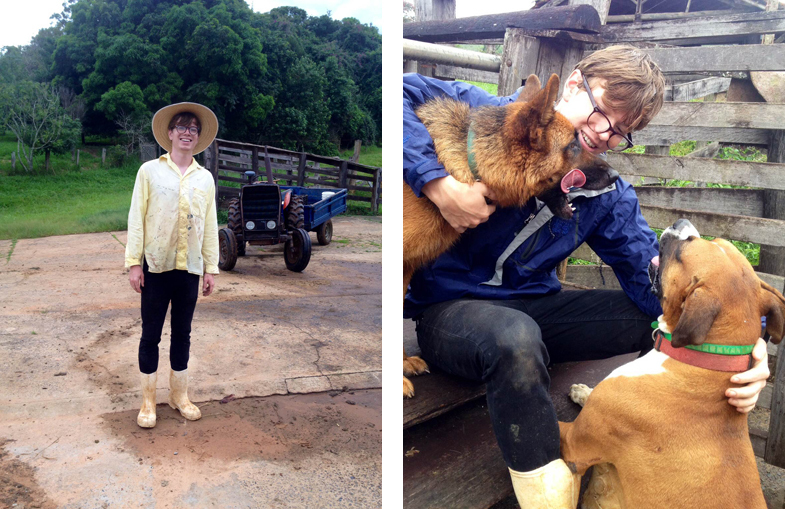 Our wwoofers become part of our family and we love them. Wwoofers come with amazing skills and gifts and help us solve problems and create new projects, besides helping us with our daily challenges. The local workers have been gradually increasing their self-esteem and pride for their work with nature, since they became part of this world network. Interns are also very special because they are a link with Universities. Interns can help us collect scientific data for our different kind of farming, which is not on the books. We find that when wwoofers and interns are able to stay for longer periods of time, three to four months, it is a very rewarding experience on both sides. There is more depth and continuity in the experience and they can pass the torch to the next person or team. Good coffee makes connections. While moving into a housing co-op my junior year of college I began chatting to my next-door neighbor who was telling me about an organic coffee farm in Brazil where she had worked that past summer. I was curious. Part of my family is from Brazil and I had been there a few times so I was interested in hearing about where she went and what she thought about her experience. She told me about the particular philosophy of the farm she worked on. How it cares for the local environment, uses organic farming techniques and deeply values the skills and autonomy of its workers - and how all these factors contribute to a better bean. At this point I had only vague assumptions about the coffee production process, but I was quickly becoming intrigued. My love of coffee emerged from necessity. I was an overworked college sophomore with an eye twitch and sleep depravation from liters of burnt Starbucks swill. It wasn´t until I found my summer home-away-from-home at Nobel Coffee Roasters in Ashland, Oregon that I learned how subtle, distinct and diverse the flavors of coffee could be. So, I returned to college that fall as an aloof and slyly pretentious coffee connoisseur. Eager to impress my new neighbor with my "expertise", I invited her to try a Brazilian single-origin that I´d bought at Noble. "And what was the name of the farm where you worked?" "Fazenda Ambiental Fortaleza." And there it was right on the bag: produced by Marcos and Silvia. I wouldn´t call it a coincidence, as if this connection were a mere chance occurrence. No. Specialty coffee is just as much about community as it is about quality. Small roasters and small farmers bring people together from all around the world. And I kept this in mind. Two years later, when I was planning my own trip to Brazil, I knew I would want to come full circle and complete my coffee pilgrimage working at FAF.